Ringworld Review | RPG Review Cooperative, Inc.
Ringworld, perhaps the most famous landmark in Larry Niven's "Known Space" series was one of the few science fiction roleplaying games to come from Chaosium. Unless, of course, you count Call of Cthulhu as science fiction, and there's certainly a good argument for that. So let's say futuristic science fiction. The game is quite old of course and has not been reprinted, at least partially due, so I've been told, because of licensing issues. As a result it apparently quite collectable and commands a price to boot. Nevertheless I recently had the opportunity to run several sessions of this old classic, and thought it more than worthwhile to express a few thoughts on this classic. The product comes the early boxed era of production from the folk at Chaosium, and was primarily designed by one Sherman Kahn (ably helped by Lynn Willis, Sandy Petersen, and Rudy Kraft), who went on to write the Ringworld Companion (also worthy of a review), and write an article on the Dolphins of Known Space in Dragon magazine - but that's about the extent of his contribution to our hobby, as far as I can tell. 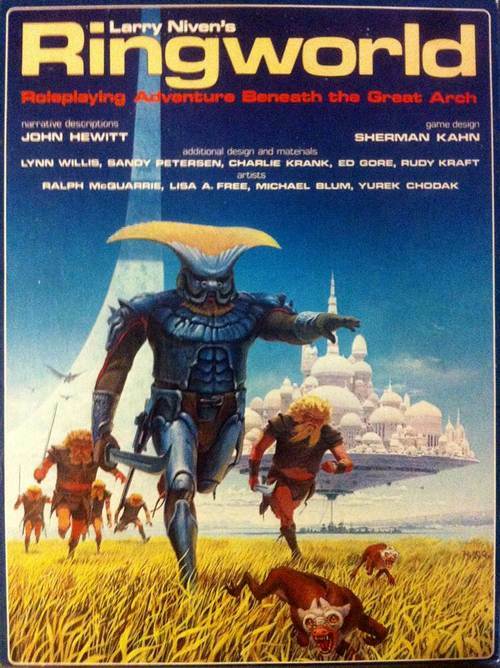 The cover art by Ralph McQuarrie is of a strange set of humanoids (grass giants), a landscape of the Ringworld horizon, with a floating city in the background. The interior art is simple, evocative, and contextually appropriate. The work of Lisa Free in particular is notable. The text itself is in three-column, ragged right, in a small serif font (a little harder to read), with chapter heading on each page and page numbers. The writing style is clear, formal, and exacting, packed with information, albeit a little dull. Ringworld comes in a fairly sturdy box, with three saddle-stapled books with cardstock covers. Each of the books has its own table of contents on the back cover, and is damn useful, like the boxed edition of RuneQuest, for allowing distribution around the game table during actual play. Split up in such a fashion also negates the need for an additional index. The inside covers of the Explorer's book includes a well-formatted character sheet, and this is repeated with several sheets in the autopilot print out. The four-page reference sheets are likewise useful and if printed on cardstock would have made a GMs screen! There is a set of cardboard heroes, plus an explanation of why there is no map - a band on the bottom of the box contents sheet explains, that if extended a further 12.5 feet in either direction, the 597,000,000 mile circumference (with a million mile width) "will give players a very good idea of the actual proportions of Ringworld". The Explorer Book includes character creation, skills, game system, time and movement, combat and damage, natural hazards, earth and other worlds, and rules for creating Kzin and Puppeteer (two of the alien species) PCs, along with a Known Space glossary. Character creation is a variant on the tried-and-true methods of Basic Roleplaying. It starts with random generation of homeworld (which determines gravity), a random roll for defects (more common that you would think), and chronological age (which varies substantially due to anti-aging drugs). The latter is a bug; with an equal distribution of starting ages from 1d6+17 up to 2d100+259, our playtest campaign started with one character aged 165 with skills to match, which was a little unbalancing. Characteristics (strength, mass, constitution, intelligence, power, dexterity, appearance) are rolled on 2d6+6. Education is 10+1d6, with an open-ended roll on 5-6, as long as this doesn't exceed chronological age minus 6. Attributes include damage modifier (derived from Strength and Mass), hit points (Con plus Mass, about double normal BRP normal), Action Ranking (based on Dex), with species-specific Speed, and possible Psionics. There are also characteristic-based percentile rolls as attributes for health (Con), reasoning (Int), luck (Pow), and dodge (Dex). Background experience percentile skill points are derived from education ((EDU-10)*20), pursuits (((Age-(EDU+6))*20), and special interests (INT*10). Educational skills are limited to a range of some twenty-five core skills, with occupational pursuits having a more limited range. The number of pursuits a character has is based on a random roll determined by their age and education. The pursuit that was actually carried out is also randomly rolled, which, along with creating a past history, also determines the starting wealth of the character (along with a luck roll). All characters begin with a standard set of equipment, plus an oddity. There's about fifty-five core skills in the game, broken up into different categories; agility, communication, perception, knowledge, and technical. Each skill comes with a base chance, and also differentiated as either "single skills" or "root/branch" skills. The later are an interesting, and largely successful attempt to deal with skills with high levels of specialisation. A character can learn a "root" skill (e.g., biology) up to the level of a category maxima, which is derived from two characteristics, and after that they must specialise. Skills are resolved the BRP way, percentile, roll under. A special success is achieved at 1/5th of the normal value, a special failure at 1/20th. A 96-00 is always a failure, modified slightly for very high skills. In skill-against-skill tests, the lowest successful roll wins. The skills themselves, representing a good range of the categories, are typically described in a couple of paragraphs each, with extra information elaborated for root/branch skills. Successful skill checks during a scenario may result in a skill check, at the GMs discretion. A roll over check or under INT (the latter recommended for skills over 100 obviously) results in a 1d6 increase. Training increases skills by 1% per 60 hours, flat-rate. The Simweb virtual reality allows for skill increases of 1d3 percentiles. There is also extensive rules for research, including modes ("armchair", field, laboratory, library) with a normal skill increase roll every 200 hours, with options for group research. Some characteristics can be increased through training (e.g., APP), and characteristic versus characteristic tests can be carried out through the resistance table ((50% + (active * 5) - (passive char * 5)). Strategic time is based on United Nations Standard 24 hour days (compared to Ringworld's 30). Tactical actions are based on "impulses" of one second. Characters have major and minor actions; major actions (like melee attacks, aiming a ranged weapon) take a number of impulses according to the Action Rating, and minor actions which only take a single second (e.g., firing a weapon, advanced melee weapons). Movement is 3m/impulse combined with other actions, or 6/m running without. If two actions occur on the same impulse they are resolved in DEX order, if the DEX is the same the actions are simultaneous. For Encumbrance, characters can carry their Strength in kilograms without penalty, with a reduction of +1 imp per every 10 kilograms or fraction thereof, and with a reduction in movement. Attacks are based on the relevant modified skill roll, with melee weapons that can be parried or dodged. Specific hit location, normally determined by a d20 roll, can modified by +1 per impulse. There is spot rules for opportunity attacks, firing into a crowd, surprise, etc. Damage can be substantial, with armour reducing, and unconsciousness resulting at quarter hit points. Damage above a hit location incapacitates a limb, more than double destroys it which can be bad news for certain critical locations - don't lose your head. Never fear, for anything less than instant death, an autodoc is hopefully on hand, as natural healing is but 1 hit point per day. If combat isn't deadly enough there's a handy variety of natural hazards that can also cause more than a modicum of harm; abrupt pressure changes, aging, asphyxiation, disease, fire, exposure to cold, falling, falling objects, collisions, poison, radiation... you get the idea. The final sections of the Explorer book is a fairly comprehensive summary of the Known Space history, distances between the main human worlds, relationships between the humans and alien species, and about a page for each of the main inhabited systems. This follows with a few pages each dedicated to creating Kzin and Puppeteer explorers, the latter being a more genuinely alien species than what is essentially big humanoid cats. The book concludes with a Known Space glossary. This history and summary of the worlds takes up more than half the book in itself, making it a very impressive summary of the Known Space setting, and actually making the Ringworld itself a little incidental. The Creatures and Technologies books are relatively short, 44 pages and 36 pages respectively, and pretty much contain what they say on the cover. The Creatures of the Ringworld setting are not overly alien, but it is good to include the Dolphins, "humans of the sea" in this collection. About a page or so is dedicated to each critter, and with the tightly packed text this provides a great deal of information. Most of the creatures aren't particularly alien at all, being thoroughly mammalian in representation, if not outright humanoid; the Sea People, the Mud People, the Grass Giants, the Ghouls, Machine People etc, all being particularly obvious examples. This is not to suggest the creatures aren't interesting however; the ghouls, despite the eating habits, can be quite friendly if approached correctly, the carnivorous pheromone-charged vampires can be downright frightening. Indeed, it is the animals, such as the mult-limbed Dendrobrach, or the gas balloon Flob, where the most alien appearances occur. To finish the book a collection of flora of Ringworld is also provided. The technology book is separated into short chapters for Generators (2 pages), Computers (5 pages), Medical Equipment (4 pages), Tools (10 pages), Vehicles (5 pages), Weapons (7 pages), and Protective Devices (3 pages). Generators includes a very wide range of devices from microcells to bakpack-sized batteries, to fusion generators that weigh thousands of kilogrammes. Computers have the capacity measured in bubble memory, with hand-held machines holding the equivalent of 100 encyclopedia-format text and images, or 24 hours of video. Autopilots act as a complex vehicle computer with a variety of subsystems for communications, life support, ship's defense, simweb, and so forth. Various autodocs are the standard medical tool with shipdocs used for organ and limb transplants (something that was quite useful during playtesting). There is supplemented by a small collection of autodoc drug packs, including the anti-aging boosterspice. The tools section is the largest in the book covering a variety of interesting, useful, and quirky, such as an autokitchen, the ever-useful comdisc (which learns new languages over a matter of hours - sort of like a slow babelfish), dolphin's ears (allows localisation of sound sources), simwebs, tri-dee recorders, communicators, etc., and the laser-based variable knife, so named for its power settings. The provided vehicles include the individual flycycles which manage an impressive 8000kph, the very adaptable all-purpose Marinex for party exploration, and a variety of other personal flyers. A small number of starships rounds off the collection. Among weapons, the main choices are various forms of disintergrators, laser weapons, tasps (which damage with high levels of pleasure), and the advanced melee weapons, the flashlight laser and variable sword. Weapons are really quite damaging; a variable sword does 1d20+5, a laser rifle, 1d20+30, and so forth. The best sort of protection against such devices is a diffusion-field generator, which does not so much stop the damage, but radically reduces the possibility of being hit. The Gamemaster's Book begins with a series of fascinating essays on life on the Ringworld, taking up almost twenty pages. These are dense and detailed, covering the principles of the ringworld's design, main scientific data, the shadow squares, the meteor defense system, the rim walls which hold the atmosphere, the spill mountains that protect and recycle topsoil, the oceans, major landmasses, the various control and repair centres, and life on the Ringworld. This is followed by the history of the citybuilder civilisation, and then over two pages of "Ringworld Mysteries", which can leave the GM dozens of scenario seeds to discovering and exploring the truth of the Ringworld. After this there is, appropriately, some notes of scenario design and the various cultures that will be encountered, the hominid alien technologies than can be found. Rather oddly, there are notes on on gravity, income and credit ratings at this stage, before moving into the psionics system, which includes a variety of paranormal abilities. The final part of the Gamesmaster's book is the journey of the Catseye, a beginning scenario which starts with an excellent business and indeed scientific opportunity to visit the Ringworld. For reasons best left unexplained, the PCs will find themselves required to traverse over several hundred kilometres of Ringworld landscape encountering a variety of creatures and cultures along the way - only to find that they may be spending a little longer than expected on the Ringworld. As far as starting scenarios go, it's fair enough as an introduction, but is certainly lacking when it comes to be a satisfying narrative. Fortunately, it must be added, there is a scenario in the Ringworld Companion which picks up where this one left off and does an excellent job. Ringworld is a marvellous execution of experimentation to the BRP system which is largely successful. It is extremely well-detailed provided great information about Larry Niven's "Known Space" and the Ringworld itself, with a well-designed product. But it does lead to the question.. whatever happened to the chief designer, Sherman Kahn?